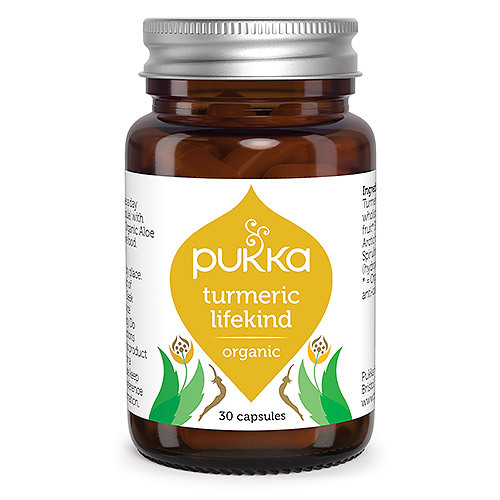 Pukka Organic Turmeric Lifekind is a vibrant organic blend containing turmeric, holy basil and green tea. Lifekind is a magical blend of some of the world’s finest herbs gathered from fertile organic soils. This unique combination of Pukka`s most potent botanical concentrates will bring all your senses to life. The broad-spectrum formula contains the highest organic grade, sustainably cultivated herbs, carefully selected to bring you the full potential of nature’s goodness. Turmeric root wholistic extract*+ 17.5%, Holy Basil leaf wholistic extract*+ 12.5%, Green tea leaf aqueous extract* 12.5%, Amla fruit wholistic extract*+, Amla fruit juice freeze dried crystals*, Bilberry fruit fresh freeze dried*, Licorice root*, Rosemary leaf extract*+, Gotu Kola leaf wholistic extract*+, Aloe Vera juice concentrate*, Ginger root wholistic extract*+, Vegetable cellulose capsule (hydroxypropyl methyl cellulose). 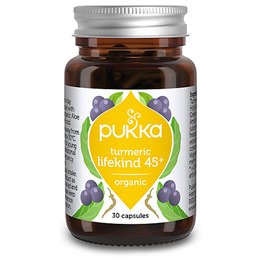 Below are reviews of Pukka Organic Turmeric Lifekind - 30 Capsules by bodykind customers. If you have tried this product we'd love to hear what you think so please leave a review.